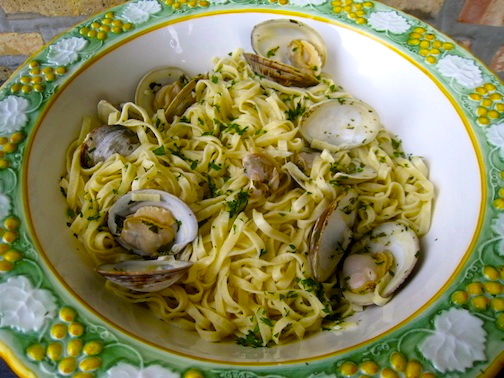 This entry was posted in Main Course (Secondi) and tagged Cooking, Food, Ham, Italian, Recipes, Sammich by ChgoJohn. Bookmark the permalink. I like bourbon and I like cola so this has to be delicious! Leftover ham will be fantastic in a sandwich. Great post John! A delicious recipe that seems pretty easy to make. We haven’t had ham in a few years now, and I’m inspired. My Mom used to make split pea soup with the ham hock and bits of ham left from Easter, that alone makes it worth making the ham. Beautiful story John. I can empathise about the basement. I grew up in a three storey over basement house myself. It was damp and spooky down there. On the goat front, a few years ago, we were in Tanzania for my brother Peter’s wedding. He was out getting fitted for a suit when a stranger to us delivered a goat. It spent its time running around the compound like a demon. We hid from it in the house. When Peter got home, he said “A goat? Damn. I’ll have to get a barbecue”. He did. He did. He bought the barbecue and had a party. Hey John i love this dish…which colour of wine Will be good? ?red or white???? Thank you. The sauce being a bit on the sweet side, I think you could go with a light Pinot Noir for red or a Riesling for a white. Of the two, the choice is yours as to which you prefer but I wouldn’t choose something very dry nor with a great deal of tannin. For me, the best part of any roast is the leftovers. I love a good sandwich and, normally, early the next morning you’ll see me heading to the bakery to get fresh rolls/bread for that day’s lunch. Yes, I’m a bit of a fanatic. Hmm … Maybe this is where Max got it from? Could it be that I’ve created the monster? John, I have missed reading your posts while I have been MIA and come back to you sharing some blog love with a link to me – thank you friend and I agree, with all of the travelling a few frequent flyer miles are definitely in order and well worth it for the scrumity mustard. Your ham looks heavenly and think it too should be added to that ever growing list for when I come and visit – at this stage I may just have to move to Chicago for a while to get through the food list. I certainly wasn’t trying to “flush you out of hiding”, Mandy, but I did want to credit you and Celia for this mustard. I’ve given it at Christmas now for 2 years and everyone loves it. And moments ago I enjoyed it on a ham & swiss sandwich. Yum! It’s good hearing from you again, Mandy. I hope your Mum’s recovery is well-underway. What i enjoy most is that there are just so many delicious dishes to be made with leftover ham. It’s the gift that keeps on giving. Interesting dish, don’t you think this is suits for braising fresh pork leg? Yes, I suppose you could, just use a low temp and cook it slowly. My family has a more traditional way of cooking a fresh pig leg, porchetta, and it’s roasted not braised. Oh that was brillaint! So many wonderful stories…you in the cellar with the goat, Max (oh naughty Max!) and the ham, and then the much travelled mustard recipe. I, like you, could never resist poking my nose in where I was told not to and had a similar “rabbit” experience as a child in Italy. Luckily I still enjoy eating it 🙂 Now, I have never cooked with cola but I think this could be the recipe that convinces me to give it a go. Will make sure the pups are kept well clear of the whole operation as they too are pretty keen on ham! How decadent! I couldn’t agree more about ham sandwiches and pea and ham soup! Refinements like deep fried pickles are new – a Bartolini speciality, or a Chicago thing, John? Thank you so much! As good as the roast was, those sandwiches were the best and the soup will be, too. I’ve seen deep-fried pickle slices here on WP occasionally. Recently, friends and I went out to dinner and the place offered them as an appetizer and, also, as a sandwich. I tasted one and was sold! Here I used Bread & Butter pickles because I made and preserved some last Fall. I can’t wait to give dill pickle slices a try. They really are quite good. I love the ham, but those pasta pictures at the end of the post do it for me, John. Fabulous. Thanks, Roger, and I must admit that I’d be hard-pressed to come up with another post that was as enjoyable to “research” as the next two were. We could have used this recipe for Sunday’s ham! Wonderful story about the bleating baby goat and your bravery, facing the spiders. Talk about fresh meat. It is hard to eat something you look in the eye, see its face, at least you didn’t name it. Excellent light on your “coming soon to a monitor near you”, too. Will share your story of the baby goat. And naughty Max with a taste for Easter ham? Oh my. Was that with the bourbon? I have a five-year old, so I am not surprised you ended up in the basement and that the “situation” ended up in tears. I also understand why the only thing you remember from your childhood dinners is the “pillows” — the meat would be forgotten here too if there was homemade ravioli on the table. Your ham looks lovely …and I can’t wait for your split pea recipe — I made it with leftovers too and it is an all-time favorite meal for the girls! Gotta love a popular dish that is made with leftovers! What a wonderful story! I can picture the creaky stairs, dark corners, cool concrete floor, and a scared little boy, eyes wide at the little goat. Reminds me of our basement growing up. There were long wooden crates that the older siblings told the younger ones were coffins. Not so nice. 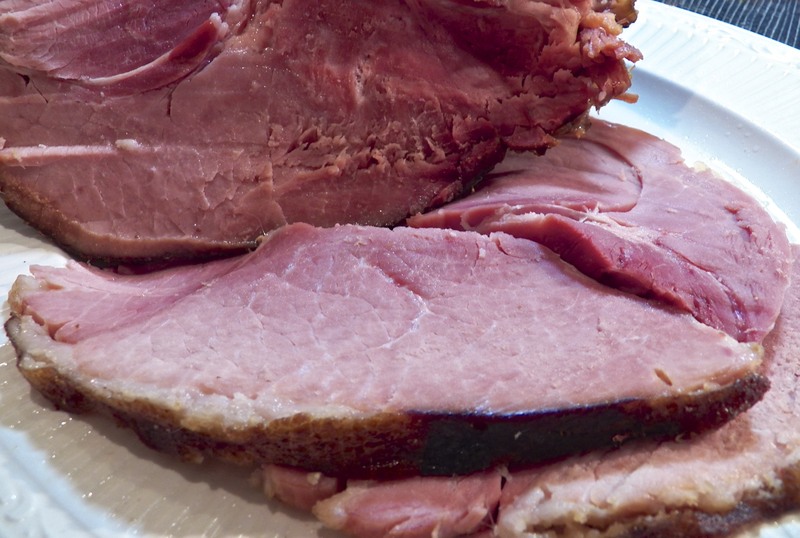 The ham looks great, but I agree sandwiches and soup are the finest uses of the noble cut. By your description, Dave, you know exactly what I meant and endured. I was so transfixed by that goat that Mom could have arrived with a marching band and I doubt I would have heard her approach. Even if I had, there really was no place to hide — well, none that I would have sought and actually gone into. I really only bake a ham every year for the sandwiches and split pea soup. Both are extraordinary. I was really young, Charlie, and it was years before I made the connection and, by that time, baby goat was no longer on the Easter dinner menu. I would have a tough time dealing with a baby goat in my cellar now. I’ll take my meat plastic-wrapped, thank you very much. You’re so right about the ham leftovers. There’s so much that can be done with them — and I intend to take full advantage. What a wonderful story! My family rarely made ham for holiday dinners, really the only time we had it was at my Aunt’s house because my Unclea (not Italian) was tired of eating traditional Italian foods for holiday dinners. My Italian family usually made lamb, rabbit or pork loin for Easter and of course a pasta dish. As a child, I prefered the pasta dish, so I can relate how you had your eyes on the ravioli. I’ll have to try your ham recipe for our next family holiday gathering, sounds wonderful! Thanks, Lisa. For a non-Italian, I guess it would be difficult becoming accustomed to our holiday dinners. I remember the looks on the faces of our dinner guests who thought the huge platter of ravioli was the main course, only to see the turkey or porchetta brought out moments later. Like you, though, none of it mattered to me. Bring on the ravioli! Oh that looks some kinda yummy! We did lamb for Easter this year. I bet that was good, too. Do you plan on sharing your recipe? Sorry….DH did the cooking and just followed the instructions on the package. Funny thing, Ken. That was the last year we had a baby goat in the cellar and it was years before I realized what had happened. I was really young and, unbelievably, out of sight, out of mind. And I agree wtih you, Ken, a hearty ham sandwich is one of life’s great pleasures. Bourbon! And Coke! And ham! I never thought I’d see there day where all three cohabited, but it looks amazing. I love the little story to start too. Thanks, Sam, and, frankly, I was surprised that they worked so well together. The honey and mustard really rounds off the bourbon & coke, making one tasty sauce. Who knew? Got to love Max, quite a character he is. As a kid, I tended to do things I was told not to do (still doing so as a mature adult) so would mostly likely have ended up in the basement. Thanks for the tip about baking the ham cut-side down. Could enjoy that ham sandwich anytime of the day, even for breakfast right now. Like Barb, looking forward to your split pea soup recipe. Oh, Norma, Max and the hams are only the tip of the iceberg. He is one very special dog. As much mischief as he creates, I cannot imagine this house without him. You and I are of the same mind. 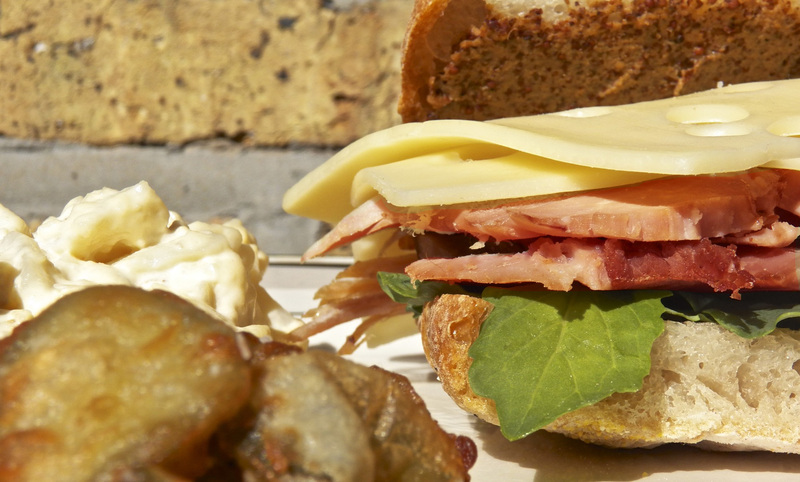 There is no bad time for a ham sandwich. I love them! Cola as in coca-cola? Who could imagine? Well, I trust your taste buds completely, I bet it is awesome! childhood memories are something! I vaguely remember my Grandma running after a headless chicken in the backyard, she would cut the head off to kill it but apparently they can still run away from you in that state. Or maybe it was my vivid imagination? I could not get anyone in my family to confirm the story for me…. I will be sitting here patently waiting for your sugo bolognese…. home made pasta, I suppose? Large ribbons, elegant, gorgeous! Thank you, Sally, and yes, the pappardelle were hand-made. If I’m going to go through the trouble of making a true Bolognese, I’m going to make pasta for it! I honestly thought the story about the spiders was just to keep you out of the Easter treats. I had no idea that you were leading up to the story about the goat. Oh my, well at least she was not preparing hare/rabbit for the family feast. I guess it could have been worse. Now on to that ham loving that glaze and it really is all about those leftovers and making awesome sandwiches and pea soups. So what is that I see in the coming attractions, oh my that looks delicious. Buona notte, BAM! Unfortunately, there’s a rabbit story — not involving Easter — but I don’t think that one will be shared. As for the goat, I was really quite young and it really was a few years before I realized it’s fate. Ignorance was bliss. 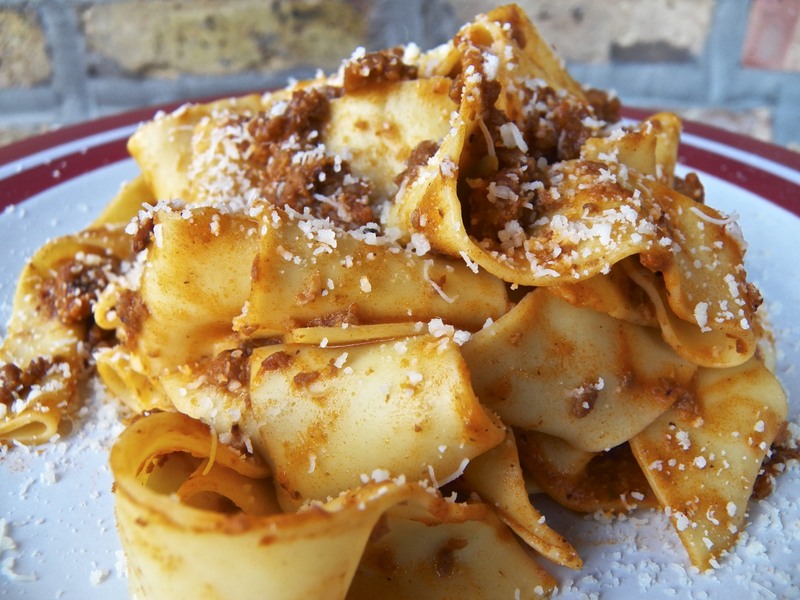 Next week’s photo was hand-cut pappardelle dressed with Bolognese. Having taken cooking lessons while on holiday in Bologna, you’re more than qualified to critique my recipe and I’m looking forward to your expert opinion. Great stories! Mums always know when you are up to something you aren’t supposed to be doing. 🙂 Never fails. The pillowy ravioli would also have stolen the show for me too if I were at your mother’s table. Hope your week is going great. Take care. Yes, Geni, we’ve talked before of Max and Sadie. They’re related in some odd way, to be sure. I now put platters on top of my coffee maker and balanced atop the blender. If he figures out a way to get at those plates, all is lost! I agree that a ham & swiss quiche is delicious, as is sliced ham with eggs & hash browns in the morning, or, ham in a pasta carbonara. There is just no bad way to serve ham leftovers in my book.That’s why I bake one every year. Our weather is supposed to warm tomorrow, allowing me to get out into the garden. Yay! I hope your week is filled with similar pleasures, Geni. How could you tell Max off!! Putting such temptation in his way! Obviously the second Easter he felt a taste of your ham was worth the punishment – quite an accolade. The sauce is surprisingly good, though let the alcohol burn off before tasting, It’s pretty potent before that. And keep an eye on that saucepan. You don’t want it to boil over. What a mess! Great stories. And great recipe. I’ve made something quite similar, although without the cola (the bourbon was there, though!). This is actually fun to try outside on the Weber. I’ve only done this a couple of times (and used a different flavoring combo when I did) but it adds wonderful smokiness to a “city” ham (I don’t think I’d try the Weber method with a country ham). I used to live in Texas, and in the western part of the state where they raise both goats and sheep, goat is almost the universal favorite for eating. Sheep are considered “dirty” (they are raised mainly for wool). Anyway, fun post – thanks. Oh, how I miss my Webe!. I just do not have a safe, convenient place for one anymore. I’ve never grilled a ham but pork of any kind on a Weber is a real treat! Because of the number of ethnic groups here in Chicago, I’m sure goat is available but I’ve never seen it. Besides, I’ve only so many opportunities to prepare a roast and goat would be my last choice. Trust me, nothing will supplant my baked ham. I will not permit anything to come between me and ham sandwiches and split pea soup. Nothing! Thanks, John, for the compliments and the anecdotes. Really nice glaze John. I make one that’s similar w/bourbon but never thought to try the Coke in there which I will definitely do next time. I’ve been using a mustard made by Maille – Old Style whole grain dijon mustard w/the little seeds in it – it’s very tasty. Oh boy, can I relate to your Max & trying to keep food for the people in the house! We brought our Lola to my sister in law’s one year for Thanksgiving & she left the turkey to rest. My daughter & I were sitting at the table and both turned to see Lola licking the bird. I grabbed Lola in time to rescue the turkey & we decided to not mention anything (but we didn’t eat any of the skin that year). Why get everybody upset right? Then there was the roast that disappeared from my counter…not only had Lola grabbed the prime rib, but she’d taken it to the family room & was eating it on the couch! She showed no remorse whatsoever. I think you’ll enjoy the cola, Diane. Not only does it add flavor but the sugar in it helps to make a bit of a glaze, though not as thick as many recipes. Your Lola and my Max could be related. The turkey story and your “solution” are priceless! And prime rib!?!?! Too funny — now, but at the time I bet you weren’t laughing. Max has sampled far more food and ruined more of my dinners than I will ever tell. Nothing on the stove, even while simmering, is safe. He’s grown older and all that’s changed is that he’s gotten much smarter about it. I never see him do it now, only the after-effects and him in his crate. I think your Max would be a perfect companion for Lola although we’d never get any food on the table except maybe a salad. You’re right I was not laughing when the prime rib – not even cooked so all bloody – landed on the sofa! I guess that’s the downside to having dogs who can reach counters. Hi John, your Max sounds like one smart dog. I hope you let him have some this year. Now I do wish I’d seen this recipe earlier, but I’m bookmarking it anyway. We have ham more than once a year.. it’s my favorite for left-overs as well. What a great sauce this would be!! And Max.. I just love Max… that’s it, he can sit at my table and tuck into a slice of ham when he visits.. then he would be sent home with such bad habits..
More than one ham a year?!?!? My admiration for you just grew by leaps and bounds! I’ve heard stories that people lived as you do, feasting on ham, but I thought they were just that, stories. Goodness! It’s as if I’m seeing the world with new eyes. I was raised on a farm with a large goat herd — around 100 or so. To this day, there is nothing so adorable to me as a kid goat–kitten and puppies can’t even compare–so I can sympathies with your basement experience on both levels (my great aunt had a creepy-smelly basement I dare not enter unless properly challenged by an older sibling). Thank you, Judy, and you do know all about goats. They sure are cute when young, as are lambs. Hi John! Excellent recipe, the bourbon would totally compliment the salty briny ham! I’ve cooked ribs in cola before and the results were crazy good—it’s probably all that sugar! And using the ham in the split pea and the sandwich is making my mouth water (damn, lunch is two hours away, gotta workout first!). That Max is sure a naughty little guy, he must have carved a huge spot in your heart not to have had a bigger punishment (knowing how much you love food!) I would also risk being crated for an entire day for some of your ham!! I must refresh my memory for that delightful déjà vu; although I know JT would be absolutely all over the Bolognese! Thank you so much, Eva, for always leaving such gracious comments. You are spot on with your assessment of the cola’s effects on the ham. And I agree, it must be the sugar. As many fowl as I saw butchered and helped dress, I never realized where the goats went until years later. I was very young and they could have told us the goats went to the same farm as the dogs. (Ahem) I got to a nearby live poultry shop for my Thanksgiving turkey. You pick your bird and they’ll slaughter and dress if for you while you wait. They will pray over the animal if you request it. I do not enjoy the experience but I force myself to return yearly otherwise it’s too easy for me to forget what is going on before my meat hits the cellophane wrapping. Thank you John, Max is motivated by food much like we are, and I couldn’t blame him with the gastronomic dishes coming out of your kitchen! That is a very interesting experience, what respect you must have for that turkey. Is it much more expensive than a regular free range, antibiotic free turkey? I’ll have to check out our butchers to see if they do it here. How would you know which one looks good? I’ve only ever seen them thoroughly plucked, dead of course. Do you have Wegmans in Illinois? I understand that they are an experience in merchandizing I’d love to see. What a tender-hearted young woman you were! With chicken suddenly off the table, literally, your Mum must’ve had a bit of a time adjusting her meals for the family. Sorry, Eva, there’s no Wegman’s this far West. Ironically, you’re closer to them than I. They’ve stores in Buffalo & Rochester, New York. This could easily be a contender on a “last meal” list. I’m salivating. Good choice. How many courses in this meal? So enjoyed the story of crafty Max, sneaking a few bites of ham and then nipping into his crate to foil you with feigned innocence. I can imagine the comment bubble above his head: “Who? Me? I didn’t do it!” (A phrase I heard often over the years from my son.) 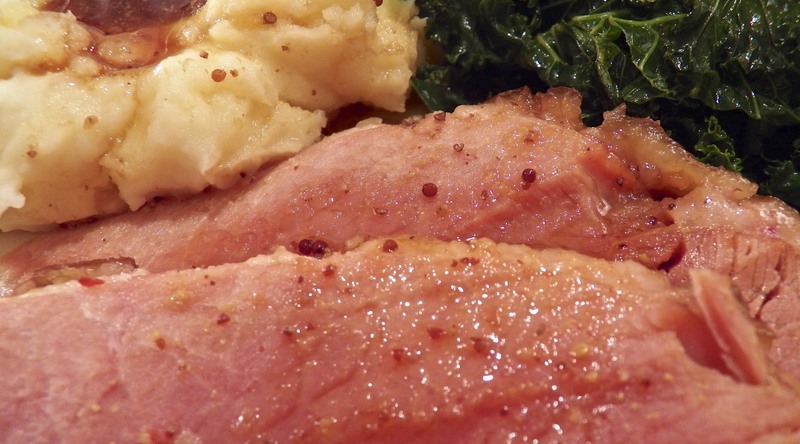 Even a dish as tasty as this ham is more delicious when accompanied by a good story! Thanks, Mar. I’ve seen that look on the littlest members of the Clan, time and time again — and I melt every time. I don’t know how you parents do it. Holy wow, what a delicious combo–bourbon and Cola? Heck yes. Hope you had a wonderful Easter, John! Thanks, Caroline. I did have a great Easter and hope you had a great Easter and enjoyed the tourney. Ohio State did very well! Thanks, Kay. Now you know how I feel when I visit you on Fridays — only you post 2 recipes. That’s just plain cruel! When I was young and growing up on our “farm” I remember being extremely excited when the animals would be butchered. Unfortunately or fortunately I only got to see it once when I was older than you and the goat. I watched as they slaughtered poultry and helped them dress the birds, as well as the rabbits and pheasants Dad brought home from his hunting trips. The goat, though, would have been a bit much for me to handle then — and I’m not so sure i could handle it now. Having to pick my turkey and watch it butchered every Thanksgiving is not something I’m eager to see. Don’t worry about Max, Jed. He has stolen more food off of my plate, table, and stovetop, not to mention at Zia’s home, than his predecessors combined. It’s only a matter of time before he figures out a way to open the fridge. I share your love for ravioli, but unfortunately never had them when I was a kid. Thanks for sharing another great family history. I refused to eat any rabbit for as long as I had a rabbit as a pet. Now I don’t have any qualms about dispatching lobsters, but I’m not sure I could butcher a goat. Thank you, Cecile, for your kind words and for sharing your anecdote about Jennifer’s cake. Too funny! When I was a boy, with about a dozen people seated at her Thanksgiving table, while Mom brought out a platter of turkey, our dog was dragging the rest of the carcass into the basement. Mom followed “the trail” down the very same steps I’d taken a few years previously to see the goat. Luckily, she’d carved enough turkey for everyone to get a piece, however small, and there was enough ravioli on the table to insure no one left that table hungry. Like my hams, it wasn’t funny at the time but we’ve laughed about it ever since. Debra, Max has stolen .. er .. “sampled” so much food around here — and wherever he goes, for that matter — that I cannot stay angry with him. I’ve just got to be smarter. I never leave him alone where food is out and, when I must, that food is high enough that he cannot reach it. On top of the coffeemaker, on top of the blender, you get the idea. Even taking his food thievery into account, he’s the best dog I’ve had and I cannot imagine these past 5 years without him. I’m not so strong either when it comes to considering how meat gets to our tables, Debra. I’ve a feeling I don’t recall goat being served simply because the adults didn’t make a big deal of it, probably speaking of it in Italian lest we little ones would run from the table screaming. To this day, I don’t know who butchered the animals or how — and I’ve no interest in finding out, either. Thank you for the wonderful stories and I am on Max’s side 😉 ! Thank you also for that fabulous mustard recipe of Celia’s which must have appeared on her blog before I had the wisdom to find it 🙂 ! I think ham [and other meats] in cola is a rather US ‘thing’ like mac’and’cheese. Looks like a succulent recipe but since I don’t eat processed meat nor keep coke in the house . . . well your anticipated anticipated soup recipe will have sammies with a different topping 😀 ! Oh, as far as bacon bones and ham hocks go, they are already in abandon at all Oz supermarkets together with split peas, soup ‘mixes’ etc!!! Oh Milord, I find it very ‘appealing’! And I have that dreadful habit of always [well, mostly] saying how I see it! But then the doctor/nutritionist and the latest from Yale and Harvard has a fight with my being a lifelong foodie! So please bear with me! My remarks are never personal!!!!!!!!! Sort of reminds of the end of a Christmas Story where the neighbors hounds come in and swipe the turkey! Who can resist a good ham??? I sure couldn’t! I do love the story John, especially how you ended the goat tradition! We’ve always had lamb for Easter. If I were to see the poor creature before dinner, I surely would be a vegetarian! Thanks, Tanya, and yes, more than one person has mentioned that scene and Max. Thank heavens there’s only one of him or I’d starve! It wasn’t till years later that I connected the baby goat with Easter dinner. I cannot imagine what we kids would have done had we figured it out at the table. Just before Thanksgiving, I go to a live poultry shop and pick out the bird that will end up on my table. It is not a process I’m eager to see but I’m fooling myself if I think the frozen one at my grocer’s met a kinder fate. Even so, I’d never eat lamb again if i had to pick a baby to be slaughtered. Well, at least there was never a pig in the basement—so Easter dinner is saved! 🙂 Your ham looks delicious. What priceless memories, John! It is so nice that you recall them so vividly! And, who can say no to a delicious platter of fresh-made ravioli?!? Also, very yummy, interesting ham recipe too! Thank you, Stefano, for your kind words. We all have so many memories of our time in that two-flat, Stefano. This blog is becoming a repository of not just the dishes but of the good times that are associated with each. It was a special place and time and we’re all lucky to have experienced it. Oh John! You brought back some memories… As a child, we would drive out to a farm with my Uncle Tony (doesn’t every Italian have an Uncle Tony? ), where we would choose our lamb, have it… (I won’t use that awful word) and bring it home in the trunk! I don’t know how I still love lamb, but I do! Know what else I love? Ham! And yours is gorgeous! I know Nigella Lawson cooks her ham with coke, but I’d rather try this coke & Bourbon recipe with my next ham! I’m glad that this post brought back some warm memories of your youth and family, Lidia. I’m fascinated to learn how many of “us” there are. Our experiences are never exactly alike but they certainly are similar and it doesn’t matter where we call home. We share a wonderful heritage. I made it John! That cola & bourbon sauce poured over my ham was truly delicious! I will definitely be posting about this one! Thanks! Excellent news, Lidia! I’m so glad to hear that you made and enjoyed the ham. I never would have guessed that bourbon & coke would make such a great sauce. Thank you for coming back to tell me this. You’ve made my night! I’m honored that you’d consider making this ham for the G.O.’s birthday, EllaDee. Thank you and I can only hope you enjoy it as much as we — Max & I — do. Besides, if you’re at all like me, baking a ham is nothing but a gateway to some fantastic sammiches and what is probably the best of all soups. You really cannot go wrong. The bourbon sounds perfect with this. I don’t make hams often either but this goes on my list to try. I noticed you’ve made this with cured/uncooked hams. How did they compare? I made a cured/uncooked ham this year (ordered from a well known supplier) and we all found it much saltier and drier than the “city hams”. Thank you for leaving such a great comment. I, too, found the uncooked ham to be quite salty. Luckily, I decided to use a lower roasting temperature to prevent the ham from drying out. Because of this, I was able to baste it more often with the sauce and it became more like a traditional glaze. That’s important because the sauce became too salty for my tastes due to the ham. Yes, lucky. The sauce wasn’t great but the ham had this beautiful dark glaze and, since it was roasted cut-side down, it was very moist. Even so, I prefer to have a sauce and will seek out cooked hams. I may give a partially cooked ham a try, just to see the salt content, but they aren’t readily available like the fully cooked hams are. Love your story telling. There are memories I’ve erased from my mine as well. My mother raised rabbits, chickens and ducks in the backyard. Once I saw how they were killed it took a long time for me to recover from the chickens neck being rung and to this day can’t eat rabbit or duck. I love the ham sauce. We just had ham for Easter, but the next time I make it I will surely use your recipe. Oh, Francine. I, too, saw more than my fair share of poultry having their necks wrung. That’s just the way things were back then. I think we have a better respect for our food than many do today. Meat isn’t born wrapped in cellophane. I’m honored that you’d use this recipe for your holiday ham, Francine. Thank you and I hope you all enjoy it. 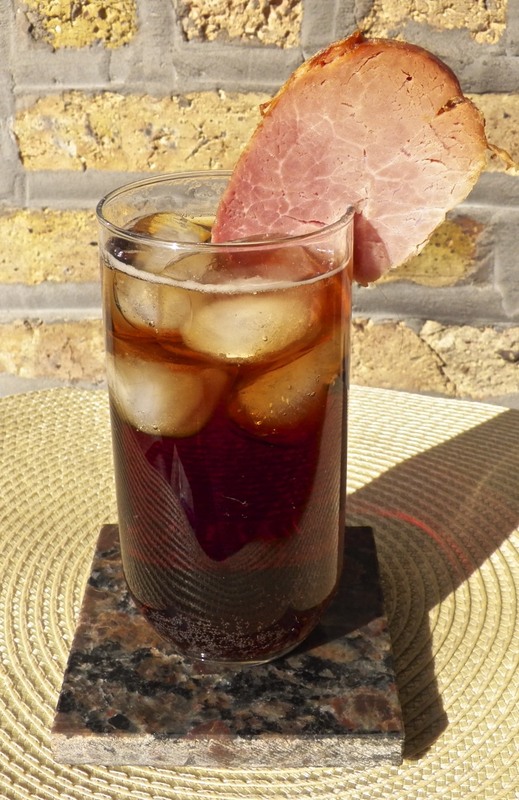 Bourbon & coke ham, how could it not taste as juicy & delicious as it looks? I bet the leftovers would make a mean croque monsieur too. On a different note, one holiday my 5 yo niece made “friends” with the live lobster. When she got to the dinner table and realized that her buddy was on the plate big tears rolled down her face … while dipping it in butter and eating. She’s always been a tough kid lol. Yes, Cam, they would make a mean croque monsieur, as well as a fine carbonara, a tasty quiche, and a lovely frittata. This is why I so love a baked ham and will always buy one too large for the occasion. The leftovers are like gold and I take full advantage. I like your goat story – and like you I’d have been terrified of the spiders (still would be) but unable to resist going to have a look. The ravioli must have been wonderful, but I’m less sure about the bourbon and Coke (being European)! I’m sorry to say I never outgrew my fear either. You should see me when I go out to do some weeding in the garden. It’s embarrassing. I wasn’t sure about the cola either. I’m not a soft drink person and can go a month without having so much as a sip. I do trust the chef, though, that I watched make it years ago and took a leap of faith. It paid off because the sauce is a good one. Now all I have to do is find something to do with the other bottles of cola I was forced to buy because a single bottle costs nearly as much as 6. Every year we go to friends for Easter where there is always a ham. Unfortunately, I know it is not anywhere near as good as the one you enjoy with your family. I know that your Easter celebration with all the food you prepare is special to all that attend. Now this is what I call a baked ham! The bourbon and cola has got to give this a wonderful flavor. It looks like the ham my grandmother use to make and that one was delicious. I’m not a big sandwich person but there’s no way I would turn down that ham sandwich. You just dish out an overdose of inspiration here John! Thank you for sharing the story from your childhood! What interesting lives people have! The ham looks wonderful! The Finnish Christmas includes a salted ham that is baked, (the meat is slightly gray in color) I’m sure this sauce would work well with it! Thank you so much. One of the things I enjoy most about blogging is that one is introduced to so many people and their customs. Learning how people celebrate Easter is a perfect example. One of the way ham is prepared here is to be smoked only. Once purchased, you roast it slowly. I’ve tried this recipe with them but the ham, like yours I presume, is a bit salty making the sauce much too salty once it is reduced. Instead of using it as a sauce, I would reduce it more and use it as a traditional glaze. Yes, our ham is very salty. Thanks for the pointer! This sounds fantastic but for me it still won’t beat the simple version cooked in that famous split pea soup! Oh and ravioli, of course. You would have enjoyed my family’s holiday dinners. Every one featured a large platter of ravioli, as well as a complete dinner. They were something to see — and even better to enjoy. John, I am not a ham person, hammy maybe, but this sounds absolutely delicious. 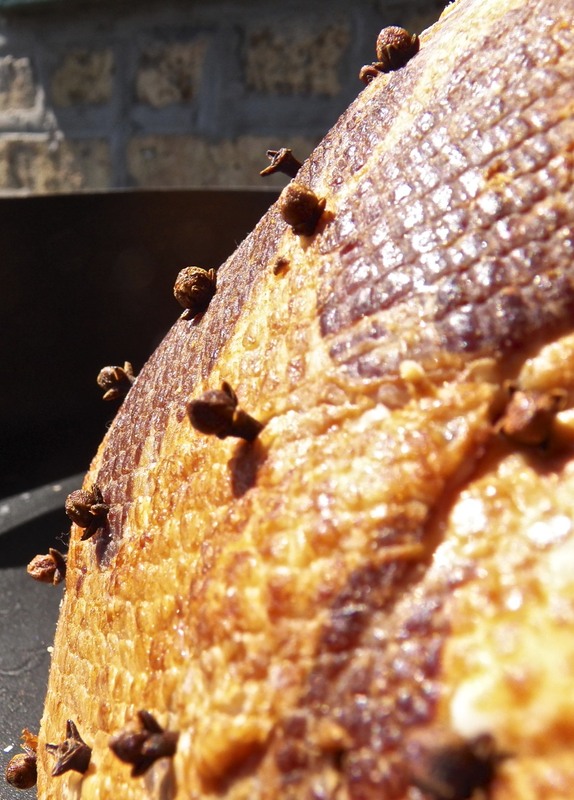 My grandmother made ham for Easter with cloves in a crisscross design. I think perhaps it’s the cloves that are off putting in my mind. I eat ham sandwiches quite often. Who knows. This was not meant to be a therapy session for Susie. My cocker spaniel, Ginger, stole my Thanksgiving turkey and held it hostage under my son’s bed so I feel your pain. Thank you, April. Your comment about being more attentive brought a smile. When I bought this ham, I was looking for a cured but partially or uncooked ham. They tend to be saltier and I wanted to play around with the sauce a bit. When I got my ham out of the fridge to bring it up to temperature, I removed its packaging. In the process, I removed the grocer’s price label and underneath it were the words “Fully Cooked Ham.” I’ll try again next year. ChgoJohn, I remember the scoring of the ham and the insertion of the whole cloves at the intersections–way back when I was a child. There might have been canned pineapple in there somewhere, too, but I can’t say for sure. Maybe even some brown sugar. Selective memories. Love your dog story. Can’t wait to hear about year three! boy-eating spiders? LOL Your blog gets better and better with every post. I’ve certainly heard about a recipe like this but I’ve never tried it. I must. I’d be diving for the ravioli too! Your story made me laugh out loud! But talking about bleating goats, we have an Islamic holiday that commemorates the sacrifice of Abraham and so we sacrifice goats, lambs cow,.,whatever in memory..but as a child I would see these goats and then one day the ground would be gushing red and we’d have a lot of meat. I really hated those days. The men of the family ate every piece of the animal…I could barely sit at the dinner table. Well, your ham looks beautiful and sounds delicious, but I really will never get to try it. I’ve made coke chicken though…. I think I would have been equally upset, Nazreen, if my parents had told us that the main course was the goat we’d heard a few days before. I was very young, though, and never figured it out. Ignorance is bliss! And I honestly have no memory of eating it. Like today, if there’s ravioli on the table, everything else just doesn’t exist. I’ve heard of coke chicken and maybe should give it a try. If coke worked so well with ham, it must be good with chicken, too. I’m glad you enjoyed this post and thank you so much for sharing your story with us. I love the way you’ve written this… I can taste it, I swear! After the Easter weekend, my crazy parents loaded our vehicle with six beef roasts to take home with us. (“We’re sick of roast beef,” they said.) I began researching different ways to make roast beef and discovered many recipes that use cola. I had no idea cola could be used so often in preparing meat! So now that I’ve seen cola used in one of your recipes, I know it’s worth a try. I’ve never heard of cola with beef but, I must admit, I’d not heard of using it with chicken until I started reading the comments. I think it’s the sugar content. As the roast cooks, the sugar caramelizes, to a degree. If it worked for ham, why not beef, too? Thanks for commenting and I’m glad you enjoyed the post. I certainly get why you switched to the ham! 😉 Great recipe, as always, John. Thanks, Francesca. To this day, I do not think I could handle seeing a baby goat slaughtered, though I’m fully aware that they aren’t born wrapped in cellophane. I have a hard enough time choosing my turkey at the live poultry shop. How did I not find this until today? But it has been a crazy week. I’ m not a ham lover but am getting used to shaved ham, just a little bit. I do remember cola covered briskets. And I had a dog, Honey. I found her on the street and brought her home. She was my first real dog at the age of 16. Many other little poodles and such were either hit by cars or brought “to the farm” because my father could never make it through the house training process. He at least found them homes close to my house so I could visit whenever I wanted. in any case, Honey was notorious for stealing food off the counter. My mother figured out that when thawing a roast she put it inside the cold oven to protect it. How Honey made it through to live to the age of 14 I’ll never know. I brought her to college with me where she would terrorize the bike riders who raced by in front of the house. Off she’d go like a wild game chasing unsuspecting riders. Good memories! Just 2 comments up, using coke for beef was mentioned. I’ve never heard of it. Now I’m seriously thinking of giving it a try, along with cola chicken. Why not? What a cute story John!! I don’t blame you at all. Leave alone gazillion spiders, damp and dunky basements can give me creeps even at this age, lol!! Goat happens to be my favorite meat and I would have loved to know how it was prepared for Easter. The ham looks very interesting, and looks delicious. I wondered about trying goat again but I’ve no idea where to purchase it. With so many ethic groups in Chicago, I’m sure there must be more than a few places where it can be bought. Maybe I should check around. I’m glad you enjoyed the post and thanks for the nice compliments. My mother has a story of my aunt winning a live turkey for Thanksgiving… yes, a week later it went on their table – and nobody ate it. I think about that a lot when I eat meat or poultry (or fish). Bournbon and cola – very nice combo. Awaiting sugo. Thanks for the recent comment. Your recipes are so creative!! Grande cuisine indeed!! Thank you so much for that compliment. Have a great day! You don’t know the half of it, Celi, but I wouldn’t trade him for the world. Sorry that your ham wasn’t as good as planned. I think you’ll like this recipe. The sauce is a good one. A chewer, huh? He’ll probably outgrow it but no telling what he’ll get into in the meantime. With luck, he’ll be like Max and never eat what he chews up. That removes a great deal of the danger. Max spends a couple hours every day in his crate. He just likes to go in there and nap. Blue will like his, too. Look at that ham… Fabulous! I’ve tried Nigella’s recipe, in which she boils ham in cola (about 2 litres of it!) 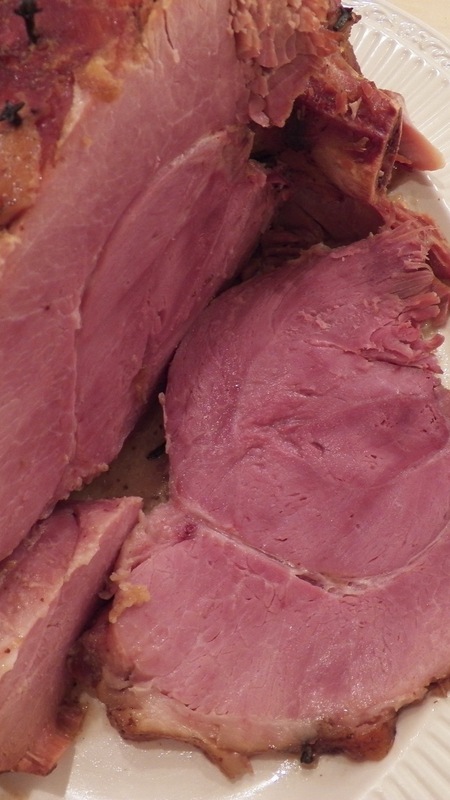 and it was good, but the problem is that I’m never quite sure I’ve got the right type of ham for what I’m making. It’s really hard to find the exact equivalent here (e.g. cut of meat, whether it’s smoked, fully cooked, partially cooked, an so on!). Maybe you can pop a slice of that in the post next time you make it! Yum. EllaDee – I’d LOVE your recipe for Baked Potato Salad !!! Could you please send it to John?? ! !